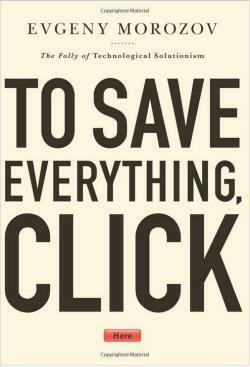 To Save Everything Click Here: Evgeny Morozov to discuss his new book at Future Tense event. In the near future, “smart” technologies and “big data” will allow us to make large-scale interventions in politics, culture, and everyday life. Technology will allow us to solve problems in original ways and create new incentives to get more people to do the right thing. But how will such “solutionism” affect our society? What will happen when deeply political, moral, and irresolvable problems are recast as uncontroversial and easily manageable matters of technological efficiency? Technology, Evgeny Morozov proposes, can be a force for improvement—but only if we keep solutionism in check and learn to appreciate the imperfections of liberal democracy. Join Future Tense in Washington, D.C., on Monday, April 15, at 9 a.m., when Morozov will discuss his new book To Save Everything, Click Here with New Atlantis senior editor Christine Rosen. To learn more and to RSVP, visit the New America Foundation’s website.